Welcome to the Watershed Resources Registry! This is an interactive online mapping tool that prioritizes areas for preservation and restoration of wetlands, riparian zones, terrestrial areas, and stormwater management control across an entire state. The tool is helpful for a wide variety of purposes but is especially useful for developers, natural resource planners, transportation planners, and others who are required to avoid impacting natural areas or to provide mitigation for any unavoidable impact. Each state's WRR team is comprised of federal, state and local partners. WRRs are now available in four mid-Atlantic states, including Delaware, Maryland, Pennsylvania, West Virginia, and Virginia. The tool has also sparked interest Nationwide. 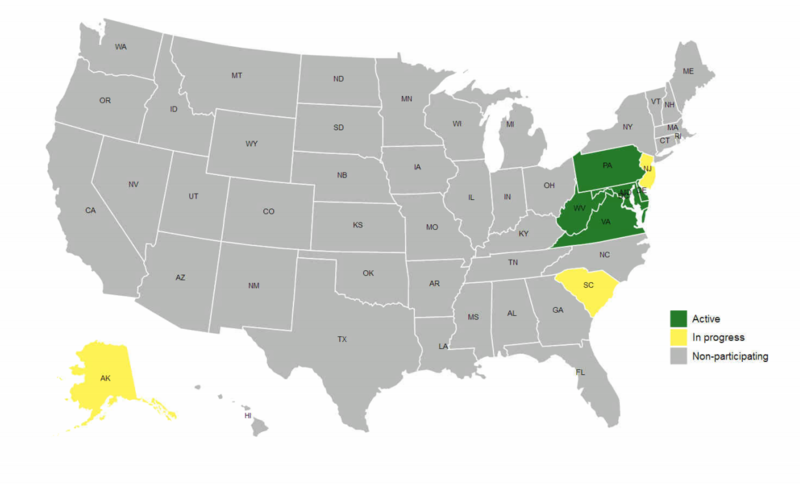 If your state is green in the map on the right, your state has an active WRR. Access your state's interactive mapping tool by clicking the "State Registries" link above. If your state does not show in green and you're interested in helping start a WRR, check out the link above for "Your Registry" to explore starting a WRR. If your state is shown in yellow, a group has begun exploring creating a WRR in your state. Please contact us if you'd like to learn more. After exploring the site or utilizing the mapping tool, we invite your feedback. Please email comments and questions to Spagnolo.ralph@epa.gov or by visiting the Contact Us page.